Peel and finely dice onion and garlic, clean and halve button mushrooms. Heat vegetable oil in a frying pan over medium heat and fry button mushrooms for approx. 10 min., or until browned. Add butter, onion, and garlic and keep frying until the onions are translucent. Add some of the flour and sauté for approx. 1 min. Deglaze with chicken stock and heavy cream, and season with salt and pepper to taste. Let the mushroom gravy simmer over low heat while you cook the schnitzel. Season the cutlets with salt and pepper from both sides. Whisk egg in a pie dish. Add flour and breadcrumbs into separate pie dishes. Dredge each cutlet first in flour, then in beaten egg, and finally coat with breadcrumbs. Add clarified butter to a frying pan over medium heat and fry each cutlet on both sides for approx. 2 – 3 min., or until golden brown and cooked through. 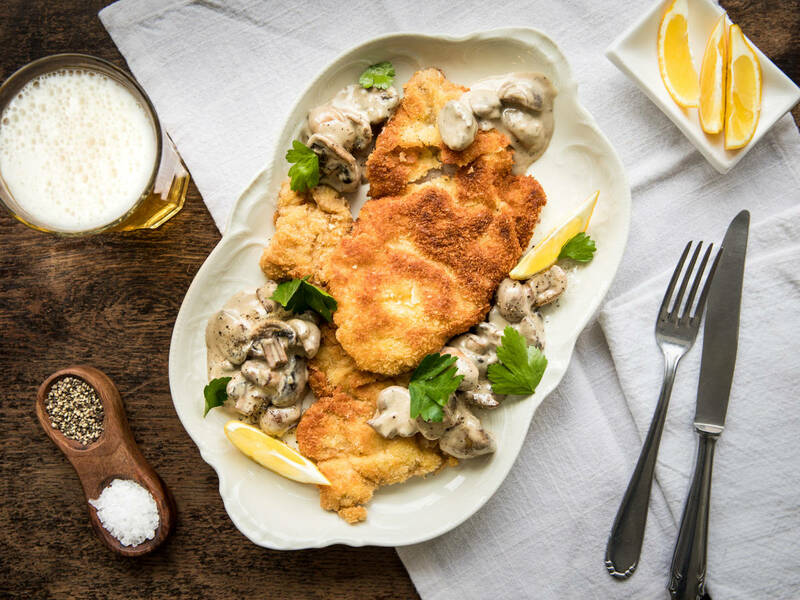 Serve schnitzel with mushroom gravy, chopped parsley, and lemon wedges. Enjoy!